Stosur, the champion at this tournament seven years ago, face a tough opening round match against Wozniacki, the reigning Australian Open champion and twice a finalist in New York. Second seed and two-time finalist Caroline Wozniacki will begin her quest for a second Grand Slam title of the year on Tuesday at the US Open, though has a big test in the opening round against 2011 champion Samantha Stosur. The two have a competitive rivalry, with Wozniacki leading the head to head 7-5, and the Dane will undoubtedly be the favorite for this opening round clash, especially considering Stosur’s struggles with injury and form the past couple of seasons. However, Stosur could be buoyed by the fact that Wozniacki has not always been in fantastic form since her Australian Open triumph in January. This will be the 13th meeting between the two, and the first since 2016. This match will take place on Tuesday, and the winner faces Alison Van Uytvanck or Lesia Tsurenko in the second round. 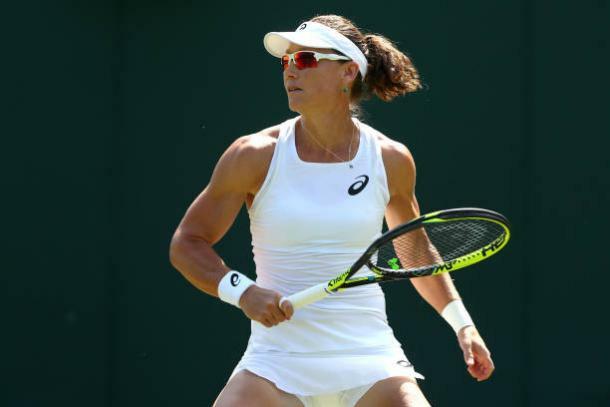 Despite being one of the leading players on the WTA Tour in the early part of this decade, Stosur has struggled in the past couple of seasons, and a poor 12 months, where she has struggled with niggling injuries, have seen her fall to 64th in the rankings. That ranking means that she was forced into qualification for the Rogers Cup and the Western and Southern Open, losing in the first round of qualification in both events; she is certainly lacking match practice heading into this. Wozniacki undoubtedly thrives on hard courts, though has arguably not been at her best in the build-up to Flushing Meadows this year. After an early loss at Wimbledon, the Dane started her build-up at the Rogers Cup, where she fell to the in-form Aryna Sabalenka despite holding a match point. The following week, she retired in her opening round match to Kiki Bertens at the Western and Southern Open, meaning she too is lacking in match build-up heading into the final Grand Slam of the year. This match will generally feature a classic contrast, with Stosur a typically powerful and aggressive player who will look to dictate play and bully Wozniacki around the court, whilst Wozniacki is more defensive, and will look to either force errors out of the Australian or slowly work her way into rallies and then take control. The key for Stosur will be to not give the Dane too many free points, as Wozniacki could easily dominate the match if she does this, and the Australian should also look to make sure that she is in a strong position to attack with her forehand- by the far the strongest shot she possesses. Though Wozniacki may be on the back foot in some rallies, the Dane thrives when she is aggressive, and though her defence will be key she will undoubtedly look to attack as much as possible with her forehand; Stosur must try to avoid this by playing the ball deep into the court and trying to create space to kill off points. Also, Wozniacki will look to attack wherever possible on the Australian’s serve; Stosur, whilst a good server, can be erratic, and the second seed will likely be aggressive on the second serve opportunities she creates. Though neither come into this tournament in great form, the fact that both have achieved great results in the past suggests this could be an interesting contest. However, despite losing both her hard court matches this summer, Wozniacki has been playing at a much higher level than Stosur recently, and should have more than enough to win this.